This is my third post about our adventure traveling through Maryland, Delaware, New Jersey, and Pennsylvania. You can find the first post from this trip here and links to all the other educational US travel we've done here. Philadelphia ranks as one of my all-time favorite cities. 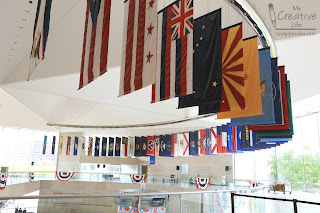 Our nation's history is everywhere you look and there is so much to see and do. Not only that, but Philadelphia has great food and is pedestrian-friendly, two things that matter a lot to our family. We arrived in Philadelphia in the afternoon on Tuesday, October 3 after spending the day in Delaware. We stayed for three nights and packed a significant number of attractions into our limited time. There's no time for rest when you vacation with the deRosiers! Obviously, the #1 attraction in Philadelphia is Independence National Historic Park. We walked through the whole park the evening we arrived. 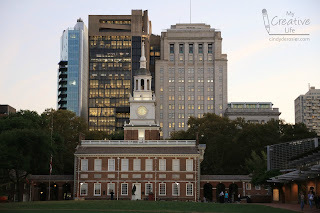 The buildings were closed, but we got spectacular, tourist-free views of Independence Hall and the Liberty Bell. 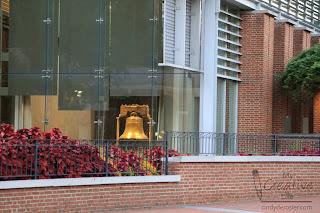 Of course, we returned the next morning to properly explore Independence Hall, the Liberty Bell Center, the Visitor Center, and the surrounding area. Allow at least three hours to see it all. While we were there, Trevor earned the Junior Ranger badge. I strongly recommend having your kids do this at every national park they visit. It's fun, free, and they end up with a nice souvenir badge. 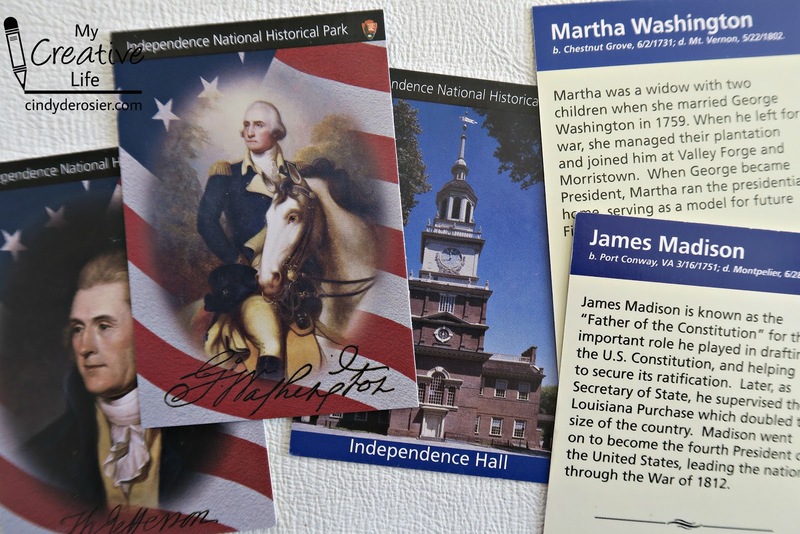 Trevor also collected Independence NHP Trading Cards. Each ranger at the park carries some and give them out to kids who approach them and answer simple questions. The US Mint is another don't-miss in Philadelphia. 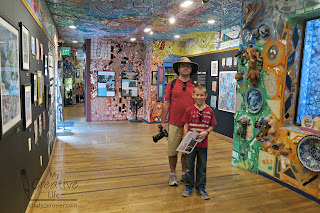 They offer an excellent self-guided tour. We loved watching coins being made and were fascinated to learn that if coins drop on the floor at any point during the manufacturing process, they are destroyed. As you might imagine, security is very tight at the Mint, which includes a complete ban on all photography. Our lone photo is of the exterior of the building. 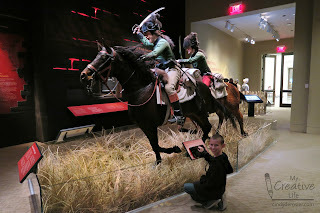 We had a fantastic time at the Museum of the American Revolution and the hours we spent there flew by. 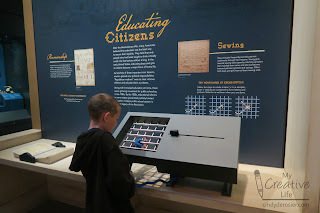 It is packed with so much information, interesting displays, lots of video, and plenty of hands-on exhibits to keep kids (and adults) entertained. 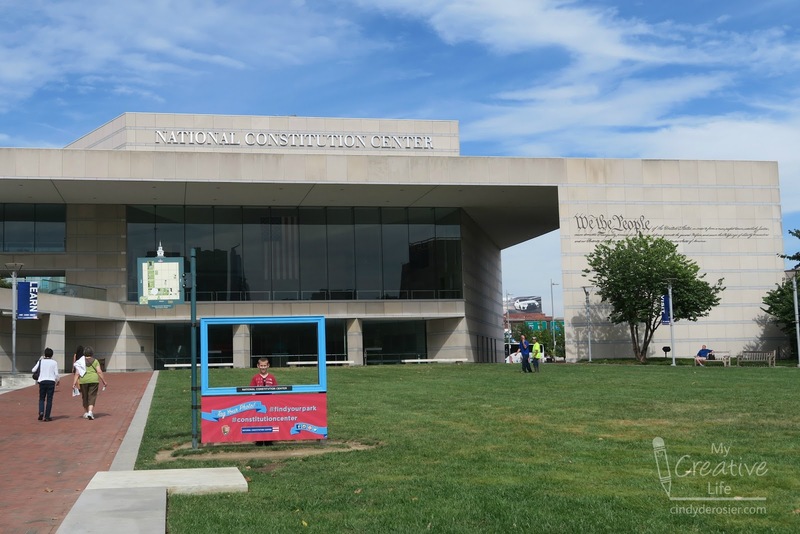 I want to mention one thing in particular that the Museum of the American Revolution does extremely well and that is having "Please touch" signs. 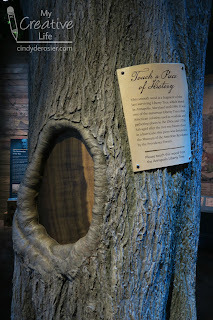 Here is Trevor touching a piece a true piece of history- part of the last surviving Liberty Tree. We ended our time at with a fascinating film, which concluded with an unveiling of General George Washington's actual headquarters tent from the Revolutionary War. No photos allowed, obviously. 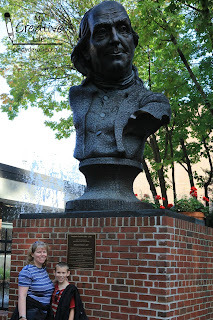 Of course, we had to do the Philadelphia Urban Adventure Quest. (We've done Quests in Sacramento, Salt Lake City, Santa Fe, Albuquerque, and Phoenix, plus we did beta testing for them in San Jose and San Francisco.) It's a mobile phone scavenger hunt and it is so much fun! It's a great way to explore a city and it always takes us to places we might otherwise not have seen. 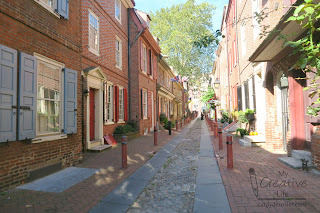 I've been to Philadelphia a handful of times before, but had never been in Elfreth's Alley before. It was really neat. 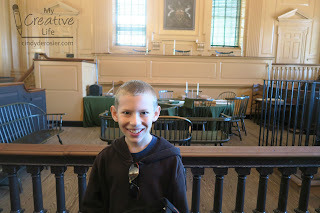 Other stops along the Quest included Washington Square, the Betsy Ross House, and Christ Church. We made two dumb mistakes and ended up with the worst score we've had among the 8 Quests we'd done, but that didn't matter one bit. We worked well together, saw things we otherwise would have missed, and learned a lot about Philadelphia. 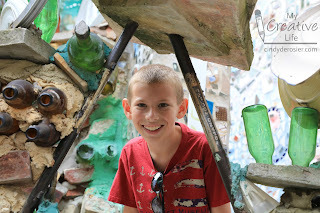 After the Quest, we headed to Philadelphia's Magic Gardens. If the word 'garden' evokes visions of trees and flowers, think again. 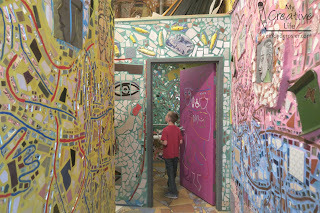 PMG is an immersive art museum and gallery made up of tiles, mirrors, bottles, and so much more. 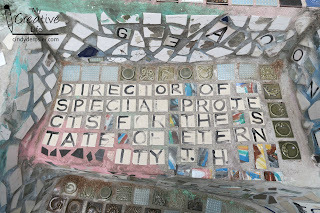 It is the work of Isaiah Zagar and it is overwhelming in the best of ways. The indoor space features mosaics on the walls and ceilings and hints at is what to come when you step outdoors. Outside, every surface is covered. It was difficult to know where to look or which way to go. We followed the winding paths and staircases randomly, with each turn revealing something new. 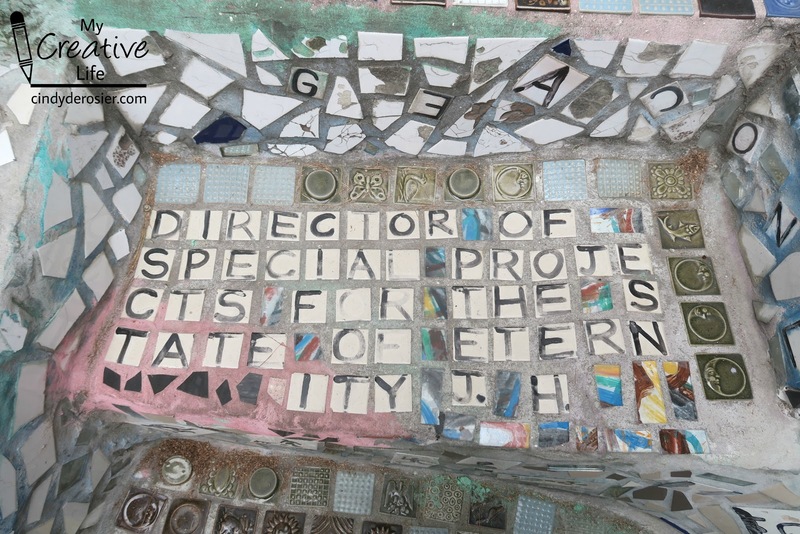 If you're up for a challenge, try the scavenger hunt at Philadelphia Magic Gardens. The three of us worked together and still couldn't find everything... even with hints from the helpful employees! It might be the most difficult scavenger hunt I've ever done, but it was so much fun and really helped us (Trevor in particular) focus our attention in a place with visual overload. One of our favorite discoveries was this phrase that we recognized from Shelley Pearsall's outstanding book, The Seventh Most Important Thing. We listened to it on CD during our drive to Oregon over the summer and it made the time fly by. I highly recommend it for preteens, teens, and adults. 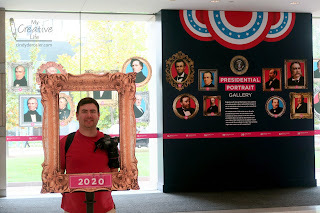 I'll share one final must-do before wrapping up the post and that is the National Constitution Center. Wow- what a museum! Unfortunately, there is no photography allowed in 99% of the exhibit space. I'm not sure why, but I'm a rule follower, so I didn't question it or try to sneak photos. But I would love to have photos of Trevor in a voting booth, listening to actual quotes from a Democratic president and a Republican president from history and deciding which resonated better with him. I wanted a picture of him competing in a fun trivia game show. (He did really well, so he must have actually learned something from my efforts last year!) I'd love to have recorded his expression as we applied to vote in various years throughout history and he learned how many people were disenfranchised for so long. I'd definitely want photos of us dressed up like Supreme Court justices. That would make a fun Christmas card! 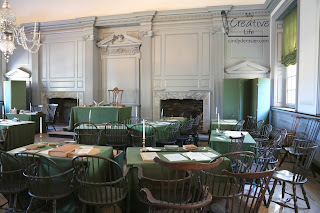 Fortunately, photos were allowed in one room, filled with life-size statues of the men present at the Constitutional Convention. 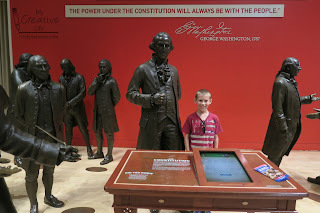 At 6'4", George Washington dwarfs Trevor. 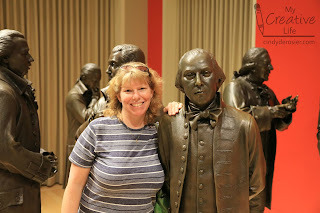 At 5'4", James Madison is more my size. Photos were allowed in the lobby, too. President deRosier, 2020? As you can see, we had an amazing time in Philadelphia. And I haven't even mentioned where we stayed or what we ate! Those deserve a separate post, so come back to read that on Monday. Philly is awesome!!!! 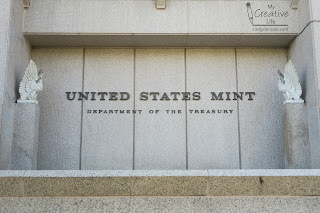 I loved the US Mint too! So interesting how they do everything there! The last time I was there, we took a horse drawn buggy tour, and we saw the house that once belonged to the original Coca-Cola owner! Of course his door was red! LOL!!! 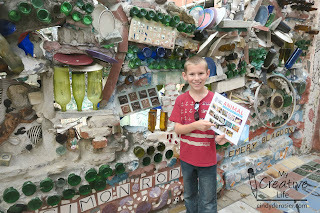 Love that Trevor gets to explore other states in such a fun and educational way.